London-based architecture firm Tonkin Liu has revealed its plans for a family of fritted-glass skyscrapers, which will be arranged around a central plaza in the Chinese city of Zhengzhou. Five tapering towers scoop up from a podium surrounding a central garden, taking a form not dissimilar to the recent £1 billion tower complex Santiago Calatrava designed for London's Greenwich Peninsula. 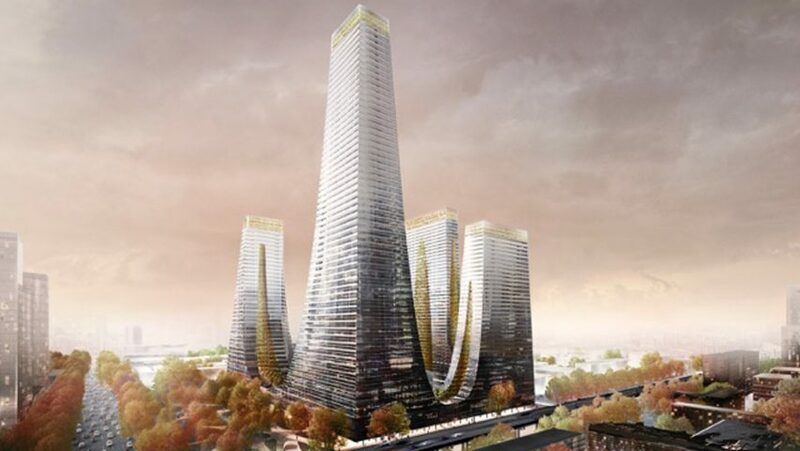 Tonkin Liu won an invited design competition to design the 434,000-square-metre mixed-used complex in named Cradle Towers of Zhengzhou in January 2016. The towers will contain apartments, offices and hotel suites, while shops and leisure facilities will be placed at podium level. The peaks of varying heights are modelled to create a "mountainscape" based on Zhengzhou's hilly terrain. "We feel we have developed something innovative, exciting and unique," Mike Tonkin told Dezeen. "Hollowed out to form a ring, the podium forms a threshold between the city and a soft, sheltered landscape within," added the studio. "Zhengzhou is the cradle of the nation's civilisation. It sits at the heart of one of the earliest settlement areas of ancient China. Emblematic of the the peaks of the nearby Songshan mountainscape, the Cradle Towers celebrate the city's origins as it looks to build its future." Vertical courtyards and gardens channel up through the centre of each of the five towers to ensure optimal lighting, while the facades are covered in fritted glass. The top of each courtyard would be enclosed by a rooftop glasshouse to introduce greenery into the city's skyline. The towers' fritted glazing is intended to create subtle colour gradation, ranging from dark at the base to light at the top of each block, "establishing the podium as a heavy mass and blending the lantern-like tips of the towers with the sky". A construction date has not yet been decided. Tonkin Liu and Santiago Calatrava's plans for complexes of skyscraper surrounding central courtyards follow the "courtscraper" model Danish firm BIG developed with its Via 57 West in New York.